A hot topic at the beginning of each year is organization. This makes me feel a little bit more normal since I adore organization. From containers to separate things in drawers to color coding my planner I have spent a decent amount of time in my life organizing different things with planners being my favorite. As I’ve gotten older my needs for my planners have changed as well, but my love of making my planner something cute that I want to reach for each day to stay organized has remained the same. In high school if you had told me I’d want to use anything other than a Lilly Pulitzer planner I would’ve questioned what you were saying. At the time, that planners weekly set up was exactly what I needed. However, as a college student I saw a lot more variability in my day to day schedule and keeping my activities organized so I made the switch to a daily planner. After doing my fair share of research I decided on a DayDesigner. 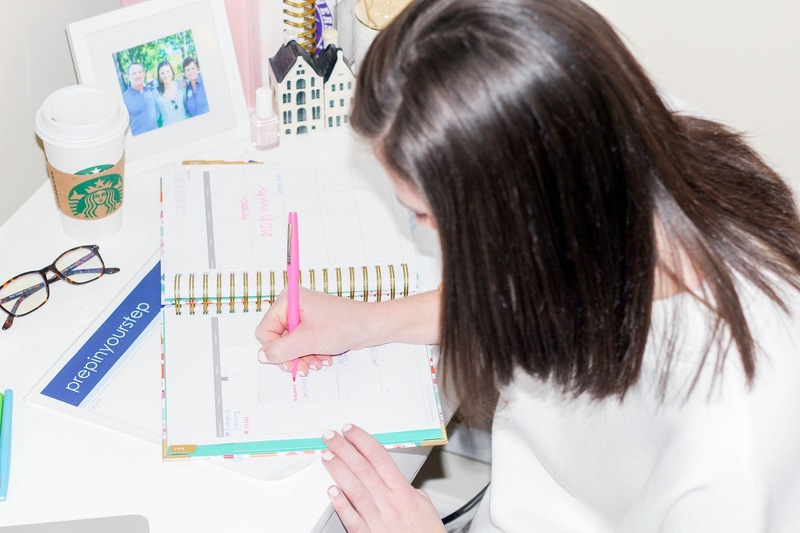 I’ll stop myself here by saying that spending $60 on a planner does seem a little bit absurd, but I use it multiple times every day and definitely find that it is worth the investment. I am currently on my third or fourth (losing count over here) Day Designer and don’t plan on switching any time soon. I was curious to see if I would continue to love it as much now that I’m teaching and can gladly confirm that I do. Although, the way I’ve used it has changed a bit since I last shared my Day Designer organization. 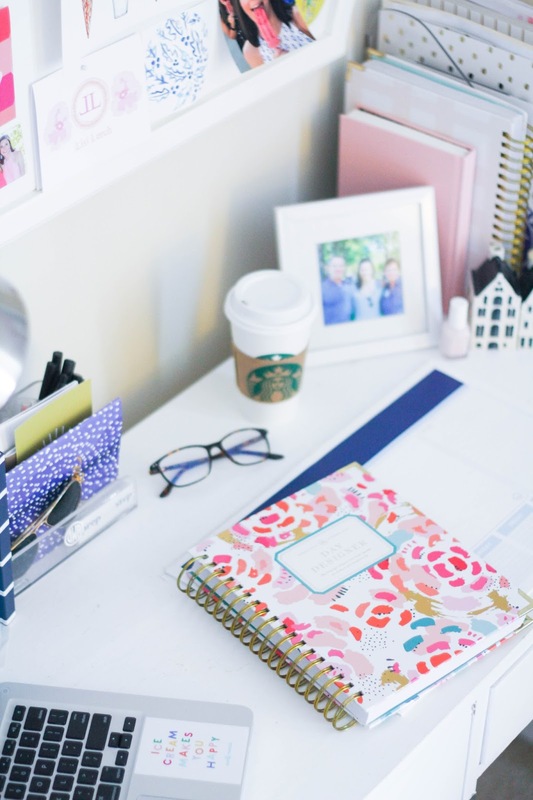 If you are interested in seeing how I used this planner as a student then you’ll definitely want to make your way to this post in order to get a better idea. 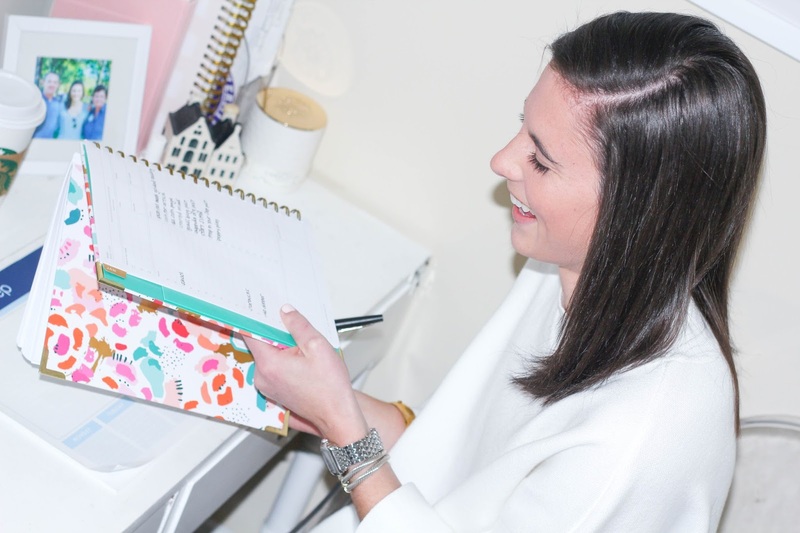 Before I fully show how I’ve started organizing my planner I thought I’d address the basics of the planner I have. At one point, I thought I was doing myself a favor by switching from the academic year to the actual year which wasn’t my smartest move. As a teacher, my life still revolves around the academic calendar so that would’ve made a bit more sense for me. Eventually I could see myself changing to a career that is more on a yearly schedule so it isn’t the worst thing to go ahead and have my planner this way. If you’re a student and plan to be for a while then I would recommend getting the Day Designer for the academic school year. Otherwise, the yearly will make the most sense. In addition to releasing Day Designers at various times there are now more than one size offered for the Day Designer. I have the regular sized one and don’t see myself ever switching to the mini. The regular size is a bit smaller than your standard spiral notebook but bigger than a composition notebook (teacher talk…). As for thickness, it’s important to note that the Day Designer is pretty full since there is a page for each day of the year inside. This doesn’t bother me but I think the mini size being that thick would be a bit more noticeable. Like I mentioned, the Day Designer that I use (and the most well-known offered by the brand) is their Daily Flagship Planner. 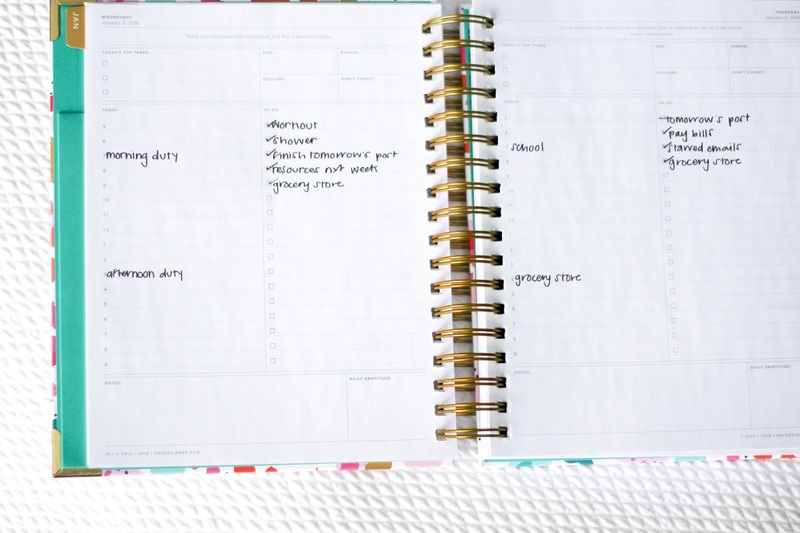 There are 11 different patterns offered for this planner so you’ll surely be able to find some sort of design you like if this Painterly Floral isn’t your taste. When it comes time to organize anything it helps to have the right supplies on hand. Over the years I’ve discovered some of the pens and accessories I prefer although I am sure there are tons of great options out there. Before starting to teach I swore by my Le Pens when it came to writing in my agenda. Now that I’m teaching and can’t imagine wasting my Le Pen’s ink when grading I don’t have those on hand both at home and at school. Because of that I’ve started to use Flare Pens since I have a healthy collection of colors in both places (since they are more affordable). The main criteria when it comes to picking pens for me personally is whether or not they blead through the pages. Since the pages in the Day Designer are sturdy and high quality I have not seen that as an issue for either of these pen brands. To mark the pages I like to use the bookmarks that Day Designer designed and sold at Target. I purchased them a while ago so I’m not positive they are still available but it’s worth checking. Fortunately, I’m sure other brands have something similar as well that could work to mark your place in your planner. I prefer these since they are magnetic and can hold a number of pages. I tend to keep these marked from the day page I’m on and the month it is and the magnet is typically strong enough to hold all those pages even close to the end of the month. Lastly, I always love a good post it note. If I have something I need to write down in my planner to keep up with but it is subject to change I’d rather have it in my planner but not permanently. I’m not picky about what type of post it notes I use but ones that match my planner are always a plus. One of the most inviting parts of my planners has to be the fact that I take time at the start of each year to decide how I actually want to organize my planner and what colors to code my different activities. Call me crazy but I pull out me pens and think about my favorite colors and which activities/obligations will have the most written in my planner. Whatever that may be usually gets to be written in my favorite color pen. From there I write down other categories that make sense for my life at the time and choose other colors that may look good with that one. Once I think I've come to a decision I write down those different decisions in the blank space on the monthly overview page for January (if you're using an academic calendar you may want to do this on the monthly overview of August or September instead). This serves as a great reminder when I'm writing down different things for the month and also helps as I adjust to my new color coding system. By the end of January I usually have this down to a T and don't need to write it again on February's monthly spread. If you're not as visual though, writing this on a post-it note to transfer from month to month as a reminder also works well. In college, I color coded both the monthly and daily pages but now that I've transitioned into the real world I've moved away from that. Now, monthly spreads get color coded and daily ones are written entirely in black. While I do miss turning to a daily page to be greeted by bright colors it is a lot easier to write down tasks in bulk without having to switch colors with each to-do. With all of your agenda organization you should be making choices that work for your own agenda organization style so I'd expect for yours to look very different than mine but hopefully this is a good start. I chose to do these together since I am one of those crazy people that has a separate calendar for teaching. Since I don't have to include everything teaching related in this planner I didn't think it necessarily need its own color. However, if I were not using a different planner for teaching I would definitely use a different color to write down all of those things). From workouts (used to have a separate color for these but this year I haven't decided I want that just yet) to dinners with friends to events it's nice to see those fun activities you have coming up. I wish that my calendar had a little bit more of these written down but I'm going to work to make socializing and spending time with friends a bit more of a priority! I also have a separate planner for blogging. I'm starting to judge myself so if you're judging me for the fact that we are at a planner count of 3 I understand. All of the planners I have are utilized almost daily but keeping things in one place is really nice as well. If I have a big campaign coming up, a phone call, a sponsored post due, or I'm meeting someone I like to have this on my personal calendar and my blog calendar. 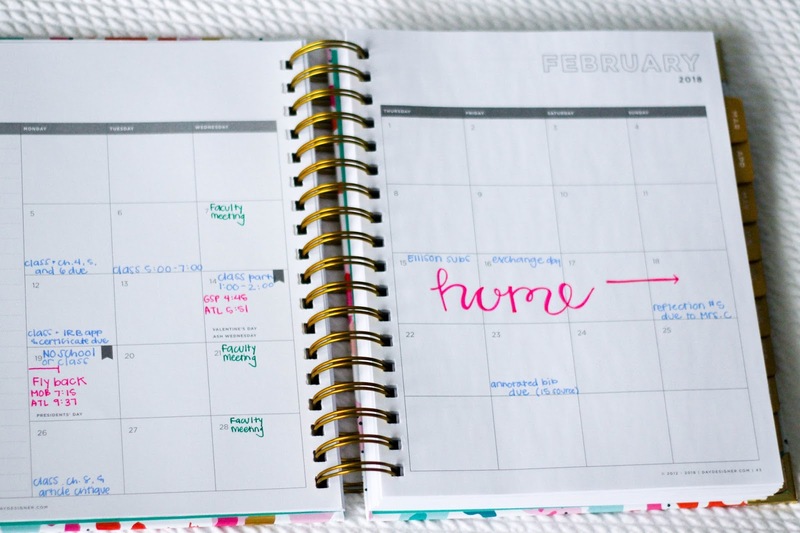 I don't write down every single post on the monthly spread of this personal calendar since then it would look a little chaotic but you can bet that those are written in my blog planner. *tip: Don't over color code. If you choose too many things that need their own color you're going to end up confused or frustrated by keeping it all straight. Stick to about 6 max (I used more as a student but feel like less is more to keep it up) and narrow it down by combing things into a larger category if need be. If you are a student, I do suggest doing a different color for different classes but if you don't feel you can keep that up then maybe choose red to write down test dates for all your classes with the class number in parentheses next to it. Over the years I've come to realize just how much of a visual person I am. This really shouldn't be a huge surprise to me, but if I can't see something or see how something fits into the big picture I'm usually left scattered. With this in mind, the monthly section of my Day Designer is a crucial resource for me when it comes to actually showing up where I'm supposed to be and getting things done. Despite each day having plenty of room on the monthly spread, it wouldn't take long for things to start looking a little bit jumbled. My monthly page becomes a bit of a lifeline for me. 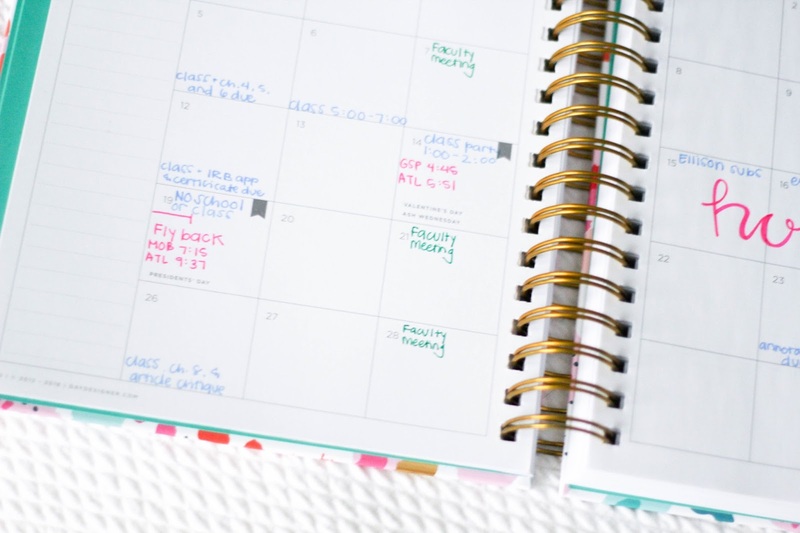 I put down key events or assignments so it doesn't start to get too overwhelming, but seeing everything in one place is a huge help for me when it comes to thinking ahead and managing my time. This is where I color code so that I can quickly think about what each thing written correlates too without having to write it down. hourly: In college when I had class I would always write down the class next to the hour portion in the color I had assigned to that class. 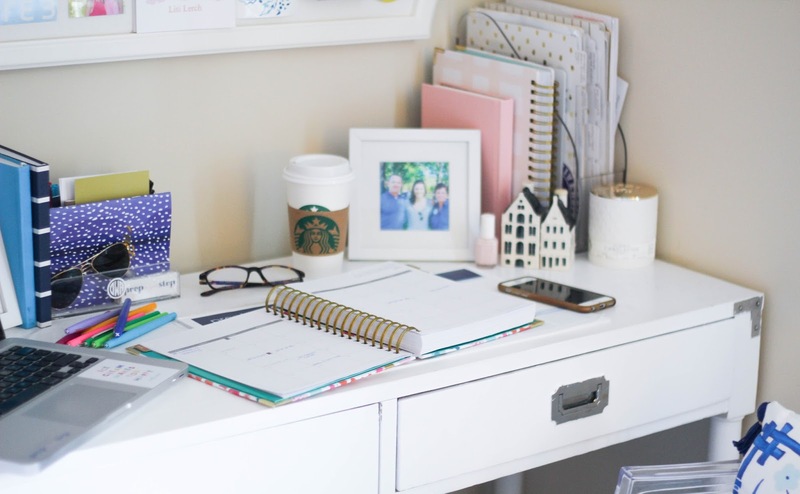 I would take time at the beginning of each semester to sit down with my syllabus and write down all the assignments for those classes and start filling in the to-do list with the assignments I had due and when I needed to start them. Now that I'm no longer in college I've moved away from this. Since I don't have a number of different classes to keep straight I choose not to color code my daily pages. Daily pages are written in black and black alone. I do write in school each day (I write it next to 7:00 even though I'm typically there around 6:40) and I also write down any meetings I may have that school day. The hourly portion of the Day Designer allows me to better visualize my day. I can write in what I want to accomplish after school (workout? grocery store? specific bed time?) and plan my time accordingly. While I'd be able to complete those things without writing them down it helps me to be held accountable when I do. to-do list: Speaking of accountability, the to-do list on every page is one of my favorite features. I fee so satisfied when I am able to check off a finished task and have always been a lot more likely to do it if I have written it down. Sometimes I'll write down the most basic things like shower or cook dinner (don't worry my friends make fun of me for this) just to be able to check it off. Those items that don't get checked off are automatically written at the top of the to-do list on the next page. By doing that, I am trying to make them a priority. unused portions: One area that I don't use as much is the part at the top right of each daily page that is broken down into due, dinner, dollars, and don't forget. I love the idea of it but am typically not organized enough to actually utilize it. On occasion I write down dinner or due (when assignments for grad school are due) but overall this space remains blank more often than not. My weekend overview tends to look like a major brain dump since more often than not it is. 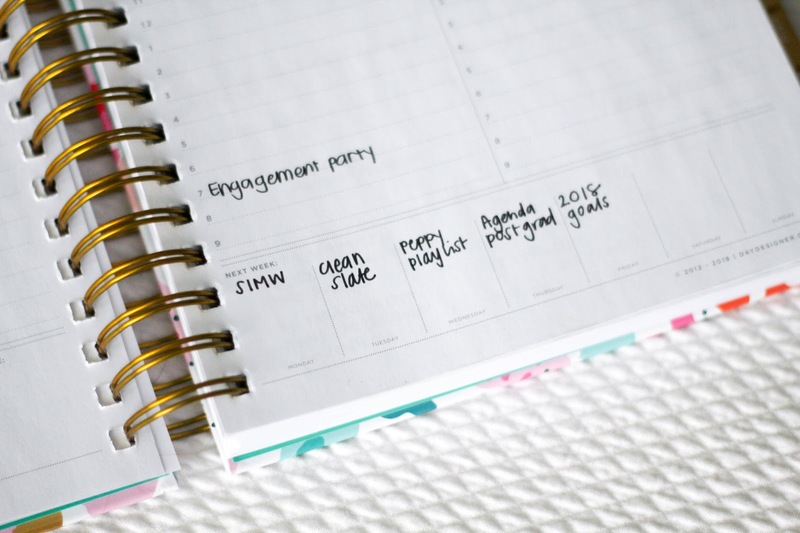 The weekend section is usually a bit chaotic and doesn't fully utilize all the features of the planner. 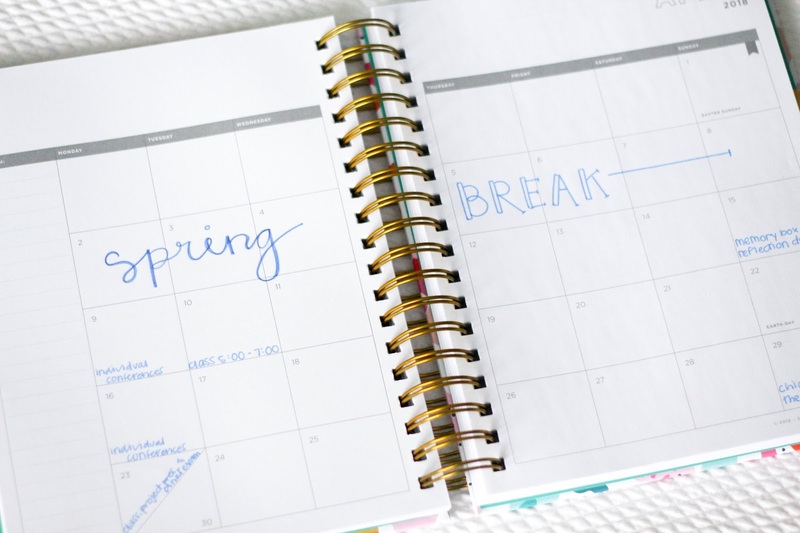 Saturday and Sunday are placed on the same page in the Day Designer and have time slots from 5:00-9:00 without a to-do list or the due, dinner, dollars, and don' forget section. Since weekends are more relaxed than weekdays I don't really use those pages in regard to the time but instead write all the things I want to get done over the weekend. From specific photos I need to take for the blog , posts to write, assessments to grade, and errands to run there isn't much organization on these pages. I'll try to write down commitments I have before writing down these to-dos but that doesn't always happen. week at a glance: This is one of my favorite sections of my Day Designer. Despite having a relatively disorganized weekend spread I feel more prepared going into the next week. I like to write out the meetings I have, when I have class for grad school (if I do for that given week), and usually my blog posts for the next week as well. In this section I try to include things that I don't necessarily include in the monthly overview. This is what works for me and what I like to do although I could see this section working well in a variety of ways. Q: How do you keep your planner organized when dates are changed and what adjustments do you make to what you’ve written? One thing I've had to accept over the years is that times and events change. 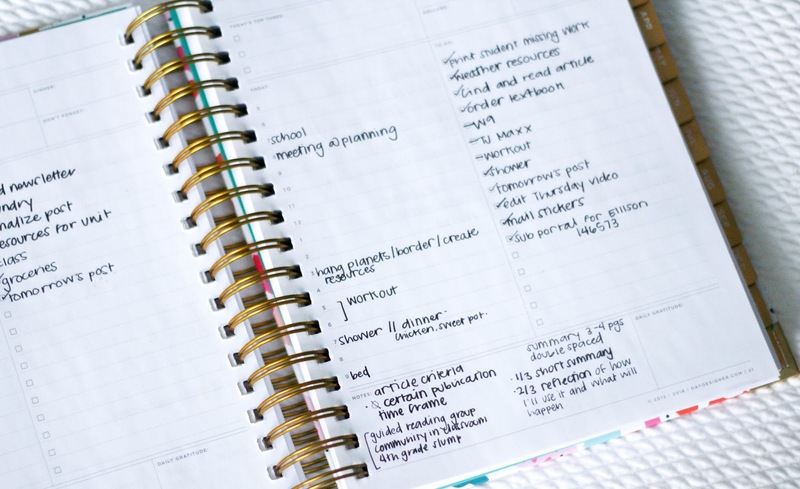 While these may benefit you in real life it's hard to appreciate them when they make your agenda seem less organized. What I typically do when something changes is cross off the changed date by putting one line through it. While I don't love the way it looks when everything else is exactly where it needs to be I have found that that is the most organized way for me to indicate something has changed. I'm not a fan of white out and putting multiple lines through it gives me more of an opportunity to mess up. Over time I've learned to accept the way this looks and move on. Q: What exactly do you write down? Every little thing or just major events? For the monthly spread I only write down major events. However, everything is fair game on the daily page. If I can check it off, it gets put down on there. As a student, assignments were one of the first thing I would write down and then meetings and other pre-scheduled events (especially those that are re-occurring. 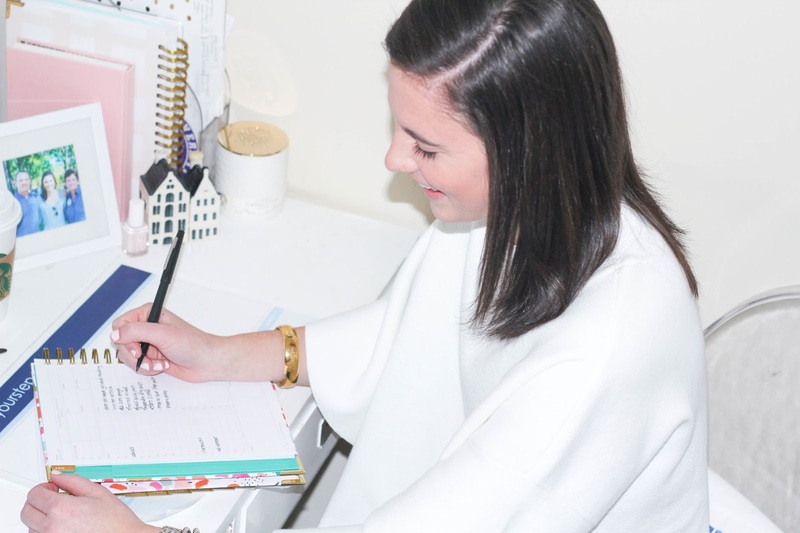 Q: How often do you fill out your planner? Do you plan by one month/week/ or day at time? This is a good question but kind of hard to answer since it really just depends. I fill out the daily section pretty much every day, adding to-dos and checking off completed tasks. As for the monthly section, I write down things as they come. I do try to sit down on Sunday and think through what all I have to do for the coming week and spread out those tasks throughout the week to make things more achievable. So, if I were giving an answer for that question I suppose I kind of do all three. Q: Do you have any tips for actually using your planner? I buy them every year and write my schedule in them, but then I never remember to open them or check my schedule. I've never had much of a problem with buying a planner and never using it since over time my planner has become a bit of a life line. While sometimes it's overwhelming to look at, I know overall it is helping me to stay on top of things. 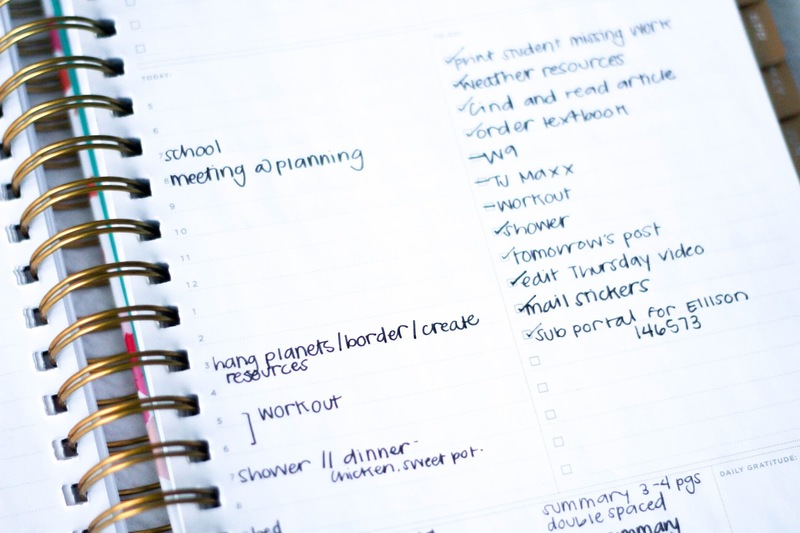 By putting your to-do list directly in your planner hopefully that will help you to utilize the planner more frequently. Carrying it with you places is another way to encourage this as well since hopefully you won't want to carry around things that you don't use which will also lead you to open and utilize its features more. 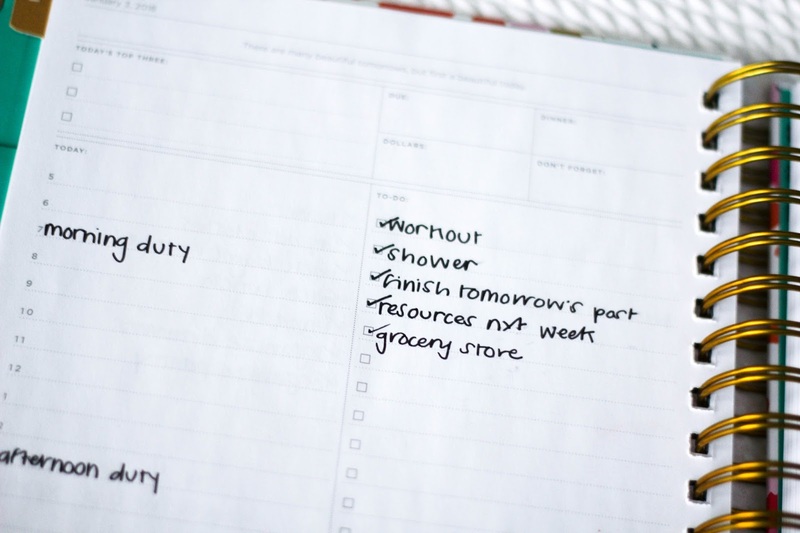 Maybe start by working time into your schedule each morning to write down what needs to get done as your initial way to get into the habit of using the planner. 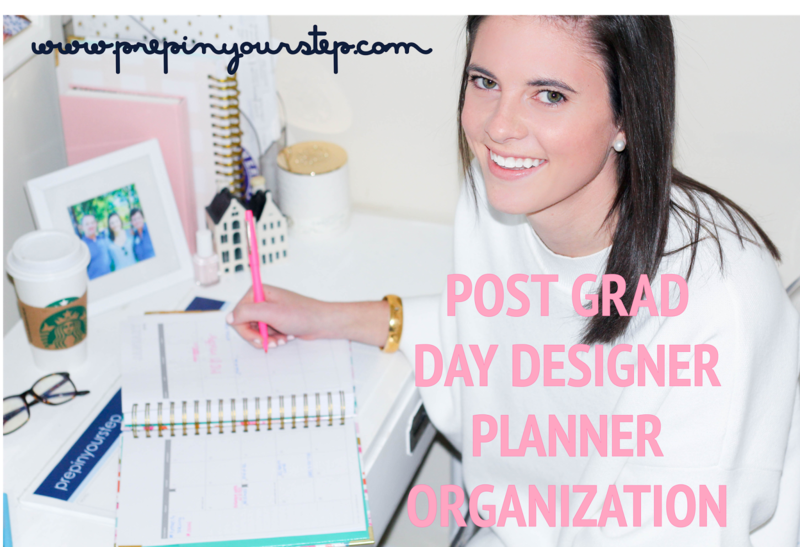 Q: Why Day Designer over the Simplified Planner? A: This is a really great question. 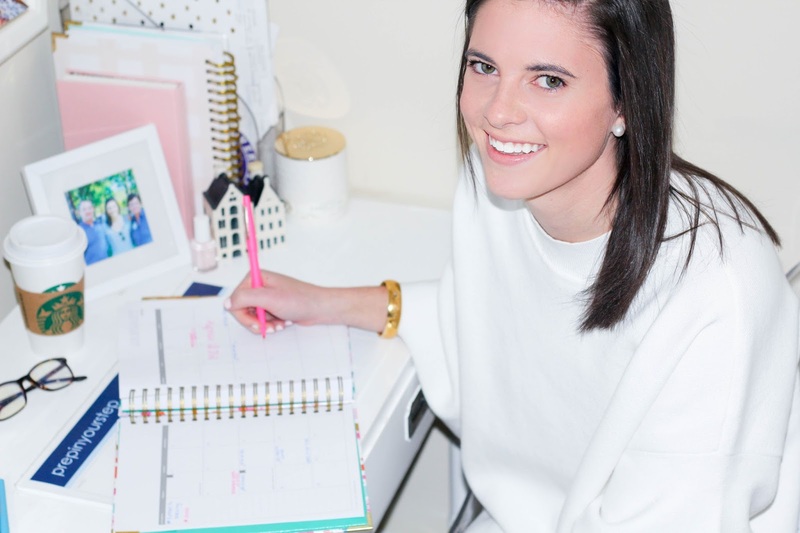 I love Emily Ley, the creator of the Simplified Planner, and think I know more about her kids from her instagram and instagram stories than I probably should. When I was first doing research about what planner I wanted it came down to the Day Designer or the Simplified Planner. These two are super similar but my decision came down to the time slots. The Day Designer starts at 5:00 am and the Simplified Planner starts at 6:00 am. I am most productive in the morning and ended up picking the Day Designer since it had an extra hour on it. Both of these planners end at 9:00 pm so the end time didn't have to play into it. Do I always wake up and utilize my planner at that time? No. Do I love having the option to? You bet. Q: How do you keep school responsibilities and personal stuff separate? Color coding has been my best way of separating different responsibilities. Q: I love the design but don’t want to spend that much. Do you have any suggestions? Target has some more affordable options from their collaboration with Day Designer. The quality will be a bit different but many of the organizational elements will remain the same. You can shop those here! Loved this. I'm an agenda freak! I always enjoy reading how everyone organizes their agenda a little differently. 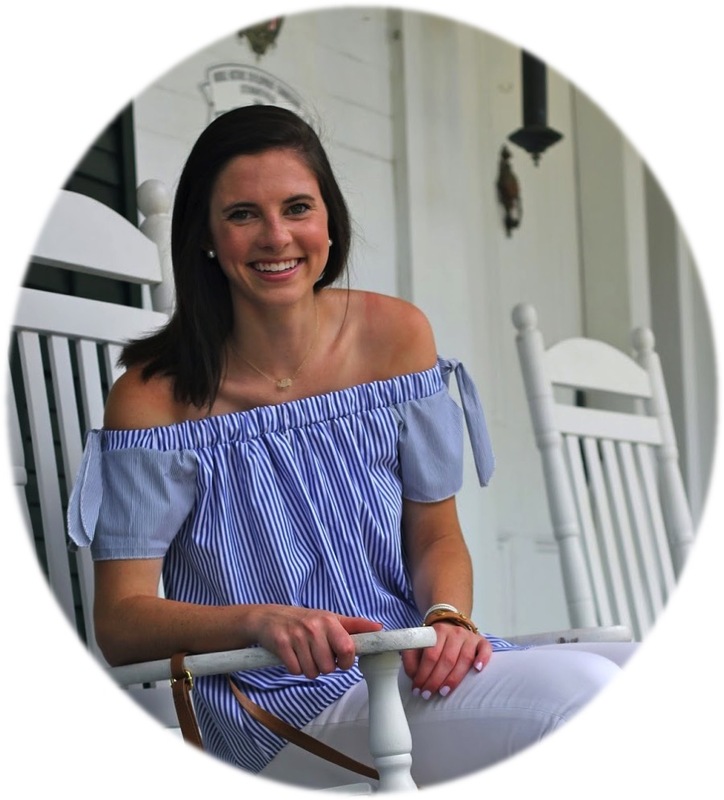 This week I published an agenda post for teachers!